The South Cottesloe Physio Dream Team won the Port to Pub in 4h 3m 22s. 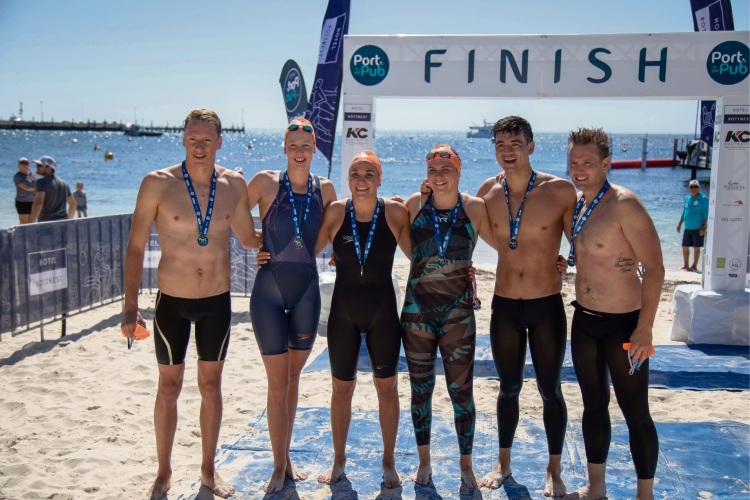 IT was a 500m sprint between the two leading six-member teams at the finish of the 2019 Port to Pub ocean swim last Saturday. Winners South Cott Physio Dream Team, comprising Gareth Evans, Andy Donaldson, Josie Page, Sacha Downing, Ben Jones and Arna Couper, won in 4hrs 3m 22s. There were 1100 entrants tackling the 19.4km route from Leighton Beach to Rottnest Island. “Our paddler was unable to assist us after the 15km mark, so we were swimming blind for the last 5km,” Mr Evans said. 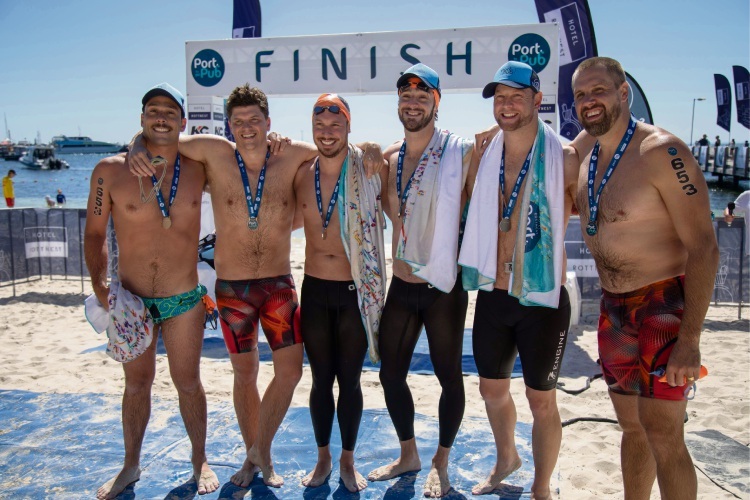 His mates were 35 seconds ahead of a Perth City Swimming Club team of Olympians and Australian champion swimmers including Travis Nederpelt, Tommaso D’Orsogna, Adam Lucas, Bobby Jovanovich, Matthew Puppazani and Jim Piper, who hold the race record of 4hr 1m 33s. 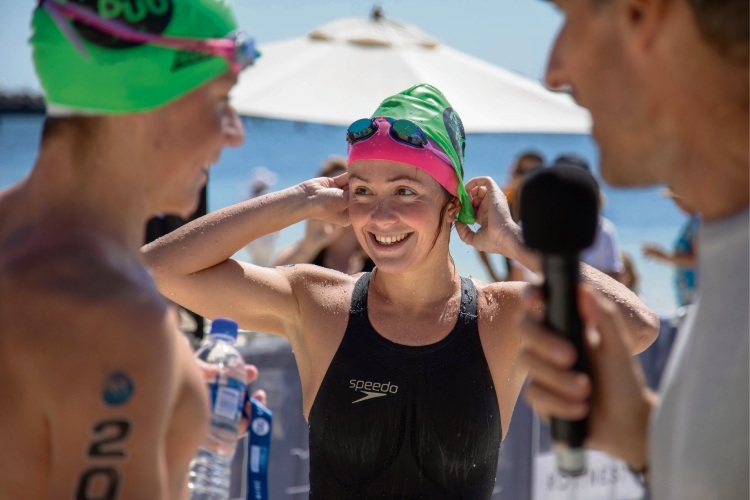 The first pair was open water champion 18-year-olds Byron Kimber and Rebekah Weller in a record mixed-duo time of 4h 11m 55s, while the first soloist was Queenslander Ben Jimmieson in 4h 59m 58m. The 25km solo ultra-marathon winner was Perth man Bob Tarr in 6h 29m 27s, after he led all the route that first went to Cottesloe and back before heading to the island. Tarr said the swim, which had 42 entrants and is the longest in the southern hemisphere, was a “great warm up” for two other open water swims is doing mid-year in the US. The first woman in the ultra-marathon was 17-year-old Brianna Thompson in 7h 4m 31s. Teams of former Fremantle Dockers and West Coast Eagles players raced, with the Dockers’ Old Salts of Jason Norrish, Lee Spurr, Luke Toia, Matthew Burton, Peter Mann and Shaun McManus winning in 6h 12m 53s. They were 5 minutes ahead of their Eagles football team rivals of Ashley McIntosh, David Sierakowski, Drew Banfield, Jason Ball, Tony Evans and Nick Stone.